Body Full’s Nonstop Volume Complex infuses fine or flat hair with 2x more volume*, touchable fullness and weightless shine. Volumizing hair products infuses flat or fine hair with 2x more volume*, touchable fullness and weightless shine. 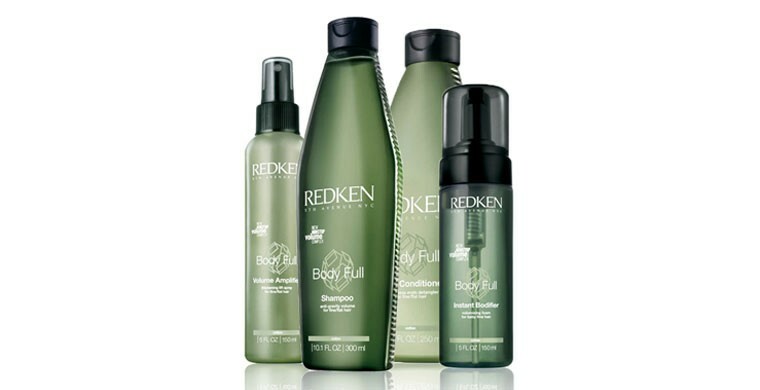 Redken’s collection of volumizing hair products will help improve the appearance and manageability of your hair. Volumizing conditioner for fine hair adds volume and moisture without adding weight to hair. It adds strength to thinning hair while detangling. Body Full volumizing conditioner for fine hair will rebalance hair’s moister to improve hair’s body and fall. Volumizing spray for fine hair, acts as a hair thickening spray that lifts flat hair. Body Full Volume Amplifier uses the Non-Stop Volume Complex formulated with Wheat Extract, to plump and volumize, Cotton, to detangle and Soy Protein to provide additional strength and support. Try this hair thickening spray and enjoy hair with more body and volume. Volumizing foam for fine hair provides body and structural support while protecting hair from styling damages. Its light weight formula uses the Non Stop Volume Complex to help volumize, detangle and provides hair with additional support. This volumizing foam for fine hair moisturizes and conditions hair while providing extra static-free shine.